If you’ve been reading my recipes for a while then you know that I am very partial to appetizers. 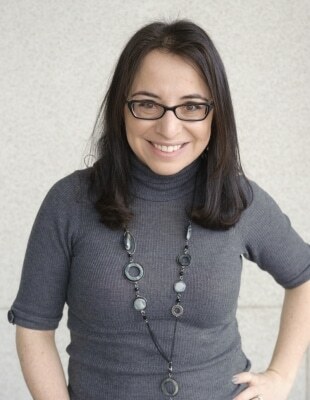 I think they are a highlight of any meal and I focus heavily on them when entertaining, as is very prominent in my 12 Tips for Easy and Stress-Free Entertaining article. First, appetizers let you explore different flavours and textures without committing to just one. You get to try all the different things and enjoy tiny bites of various foods. You can’t really have two or three main courses on a dinner table but you can certainly have multiple appetizers. Second, and this is I think the main point, appetizers are more communal. If it’s a sit-down dinner then people get to pass plates to each other and create a wonderful shared experience. If it’s a party, then appetizers provide you with that starting point: start of conversation, start of friendship. I love foods that aren’t just there in front of you on a plate, that’s why I rarely even do plated dinners. Most of the meals I host are shareables. I love the process of asking friends and family to pass plates. I love getting seconds from the big platters. I love waiting my turn to get more food because someone else is getting another serving. I love seeing the dishes on the table getting gradually emptier and emptier. In many cases, desserts are by definition one of those shareable foods. You get a big cake on the table and everyone gets a slice or two (or three, I am not judging). But cake is a bit different. It just stands in the middle of a table in its all majestic glory, tempting you. There’s no passing of plates or bumping into someone’s hand while eating it. 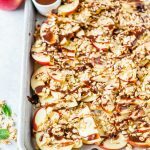 Caramel Apple Nachos, on the other hand, are an absolutely perfect shareable and communal dessert! You get sticky fingers and go back for another apple slice and another dip into the caramel sauce. 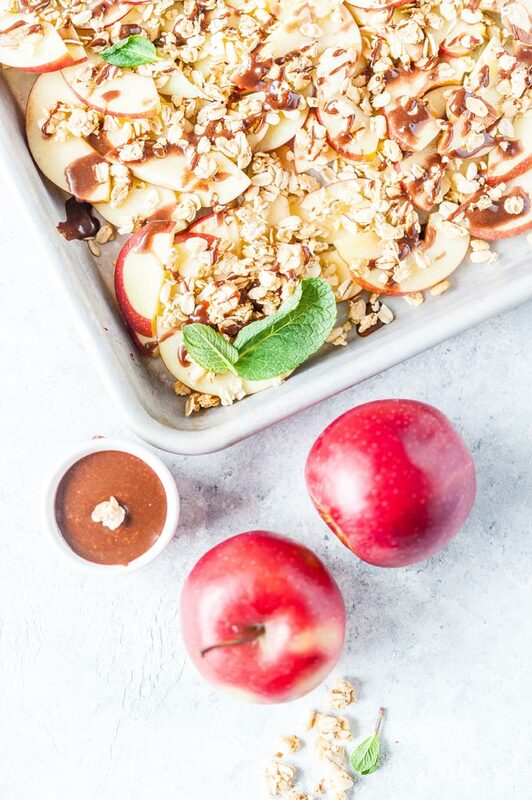 You choose that perfect apple wedge that is covered in just the right amount of chocolate caramel sauce and crunchy granola. Perfection! Personally, I am not a big fan of caramel apples but maybe it’s just because I never had a good one. So, I was a little bit hesitant about these Caramel Apple Nachos with Granola. Yet, after taking one bite, I couldn’t stop. I had to go back for more and more. 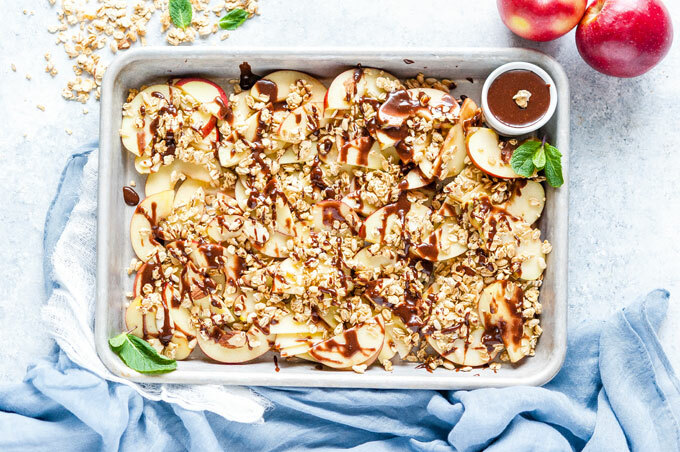 The reason why I loved these Caramel Apple Nachos so much is the combination of beautiful crisp and tart apple with rich and sweet chocolate caramel. They were made for each other! 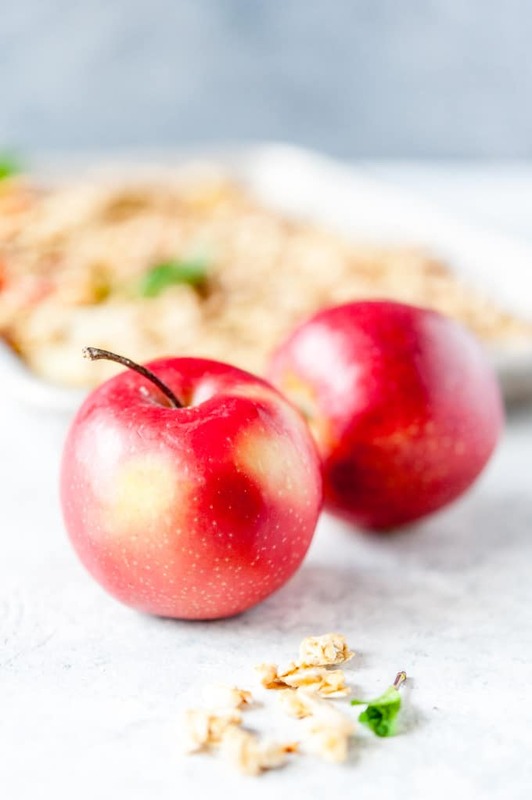 Imagine, a whole tray of delicious and fresh local apples, sliced into thin pieces, drizzled with luscious caramel sauce and sprinkled with crunchy granola. It’s an utterly satisfying and indulgent dessert, yet it is still quite healthy! 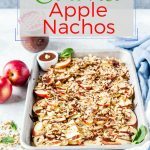 Great thing about these Apple Nachos is that they are very easily turned into a vegan and/or gluten-free dessert. Just make sure that you use vegan caramel sauce and gluten-free granola. I used a beautiful variety of apples called Red Prince. 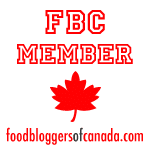 It is not just a Canadian apple, it is also only grown in Canada in Ontario, so it’s a local variety. Of course, you could use different local apples but you would want to have something crisp and tart to balance out sweet and soft caramel. Local Red Prince apples, in my opinion, are just great in these Caramel Apple Nachos. 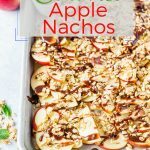 Caramel Apple Nachos are really easy to make and require no specific measurements (although I provided them in the recipe below). Feel free to use more or less caramel sauce or granola. Core and slice apples into thin wedges. Arrange the apple wedges on a big platter. I like using a 9×13 sheet pan as it adds a rustic and more approachable feel to the dessert. 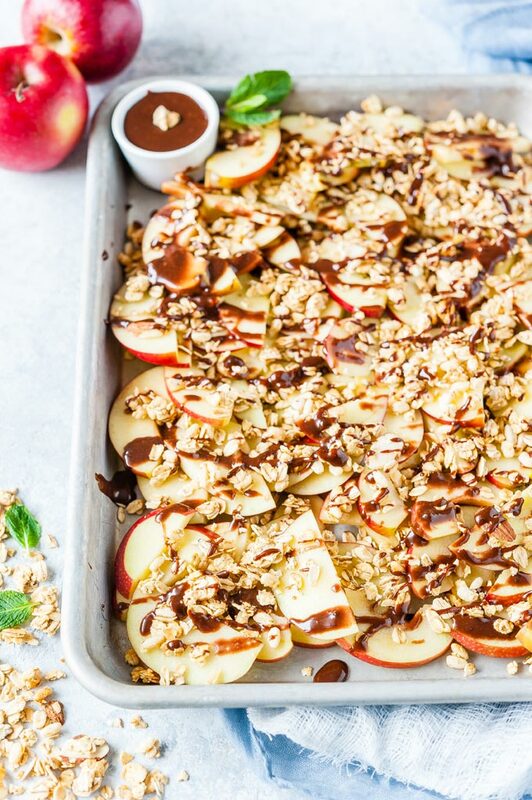 Drizzle caramel sauce over the apple slices. Use more if you’d like something a bit sweeter or less for a healthier treat. 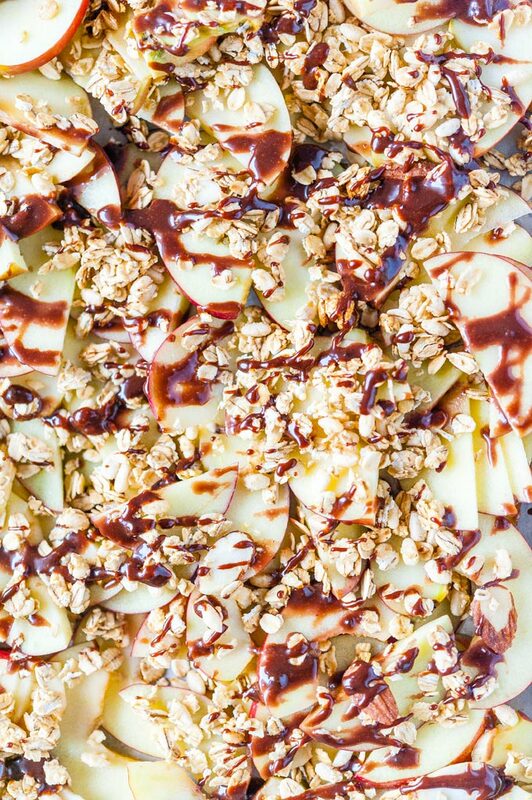 Sprinkle granola over the caramel-covered apple slices. It’s better not to make these Apple Nachos in advance as when apples are cut and exposed to air, they tend to brown. They will still be delicious after a few hours but they might not be too attractive. One of the ways to prevent browning is to use some lemon juice. Just squeeze a lemon into a small bowl and brush over the exposed sides of the apple slices once they are arranged on a platter. 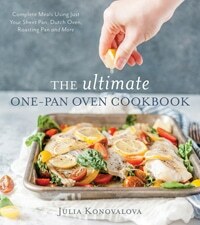 Cover with foil and keep in the fridge until ready to serve. Drizzle the caramel sauce and sprinkle your favourite granola right before serving, so that granola is still crunchy. Serve a small bowl of extra caramel sauce for extra dipping! 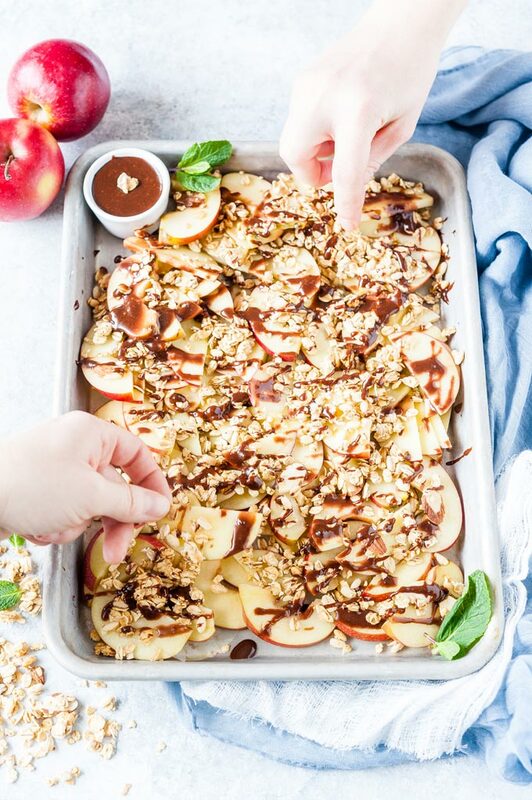 Apple Nachos are essentially just apple slices arranged on a plate and covered with some kind of sweet and gooey sauce and crunchy topping. So, you could have different variations and flavours of Apple Nachos every time you make them. Caramel and Granola like I did in this recipe. I used my Instant Pot Chocolate Caramel Sauce and thinned it a bit with cream. Add dried fruit such as raisins, dried cranberries, chopped dried apricots, etc. Sprinkle some coconut for a tropical flavour. Add some cinnamon into the caramel sauce because apples and cinnamon are made for each other. Use different flavours of granola to mix it up. Drizzle some warmed up peanut butter over apple nachos. Drizzle some Nutella over nachos. Cut each apple in half and remove the core from inside. Slice each half into thin slices. I prefer 1/16th of an inch. Arrange the apples slices on a platter or a 9x13-inch sheet pan. Optionally, brush the apple slices with lemon juice. It'll prevent them from turning brown. Drizzle the caramel sauce over the apples slices. Sprinkle the granola over the apple slices. Garnish with some mint leaves and add a little bit of caramel sauce in a bowl on the side. I used my Instant Pot Chocolate Caramel Sauce which I heated up with a few teaspoons of cream to be able to drizzle it. You can use your favourite caramel sauce. If it's too thick to drizzle, then warm it up with a little bit of cream. Use more caramel sauce if you'd like sweeter dessert or less sauce for less sweet. Use more or less granola to your taste.